Udall is a city in Cowley County, Kansas, United States. As of the 2010 census, the city population was 746. The first post office at Udall was established in September 1879. J.M. Napier and P.W. Smith purchased ten acre tract from I.N Nelson in 1879. Udall was laid out in 1881 by Napier and Smith. It was named after English author Cornelius Udall. D.C. Green built the first house in Udall and opened a store. On May 25, 1955, the deadliest tornado to ever hit the state of Kansas struck Udall at 10:35 p.m. The town was demolished by an 1,300 yd (0.74 mi) wide F5 tornado, no building within the city limits was untouched, including the grain elevator, water tower, old grade school, new high school, city hall, three churches. The water tower had been knocked over and the streets were flooded. Vehicles were thrown hundreds of yards and mangled beyond recognition, including a pickup truck that was wrapped around a tree and stripped of everything but its frame and tires. 77 people died and 270 were injured, 192 buildings (170 homes) were destroyed. Around 50% of families lost one or more members of their families. Before striking Udall, there were no warnings issued by the Weather Bureau. Unknown to them, the same tornado-producing thunderstorm had just laid waste to the city of Blackwell, Oklahoma, where 20 died and 250 were injured. According to the United States Census Bureau, the city has a total area of 0.57 square miles (1.48 km2) which all of it is land. As of the census of 2010, there were 746 people, 289 households, and 203 families residing in the city. The population density was 1,308.8 inhabitants per square mile (505.3/km2). There were 319 housing units at an average density of 559.6 per square mile (216.1/km2). The racial makeup of the city was 94.8% White, 2.0% Native American, 0.1% Asian, 0.5% from other races, and 2.5% from two or more races. Hispanic or Latino of any race were 3.1% of the population. There were 289 households of which 38.8% had children under the age of 18 living with them, 51.2% were married couples living together, 13.8% had a female householder with no husband present, 5.2% had a male householder with no wife present, and 29.8% were non-families. 26.3% of all households were made up of individuals and 11.5% had someone living alone who was 65 years of age or older. The average household size was 2.58 and the average family size was 3.07. The median age in the city was 31.7 years. 30.4% of residents were under the age of 18; 9.2% were between the ages of 18 and 24; 25.3% were from 25 to 44; 22.5% were from 45 to 64; and 12.5% were 65 years of age or older. The gender makeup of the city was 46.4% male and 53.6% female. As of the census of 2000, there were 794 people, 302 households, and 221 families residing in the city. The population density was 1,645.7 people per square mile (638.7/km²). There were 322 housing units at an average density of 667.4 per square mile (259.0/km²). The racial makeup of the city was 96.73% White, 1.64% Native American, 0.25% Asian, 0.63% from other races, and 0.76% from two or more races. Hispanic or Latino of any race were 3.27% of the population. There were 302 households out of which 41.1% had children under the age of 18 living with them, 59.6% were married couples living together, 10.3% had a female householder with no husband present, and 26.8% were non-families. 24.2% of all households were made up of individuals and 9.9% had someone living alone who was 65 years of age or older. The average household size was 2.63 and the average family size was 3.16. In the city, the population was spread out with 32.2% under the age of 18, 10.5% from 18 to 24, 27.7% from 25 to 44, 18.6% from 45 to 64, and 11.0% who were 65 years of age or older. The median age was 28 years. For every 100 females, there were 92.7 males. For every 100 females age 18 and over, there were 94.9 males. The median income for a household in the city was $37,639, and the median income for a family was $42,981. Males had a median income of $34,750 versus $20,227 for females. The per capita income for the city was $16,202. About 4.8% of families and 5.8% of the population were below the poverty line, including 8.0% of those under age 18 and 8.0% of those age 65 or over. Udall is part of Udall USD 463 public school district. The Udall Eagles won the Kansas State High School class 1A volleyball championship in 1973. ^ "History of Udall". City of Udall. Retrieved 3 May 2014. ^ The Udall tornado: Kansas town remembers the day it disappeared; The Wichita Eagle; May 25, 2015. ^ 60 years after Kansas' deadliest tornado; KWCH 12 TV; May 15, 2015. ^ Info on the 1955 Udall Kansas tornado; National Weather Service. ^ "Udall USD 463". USD 463. Retrieved 6 January 2017. ^ "Volleyball". KSHSAA. Retrieved 3 January 2017. 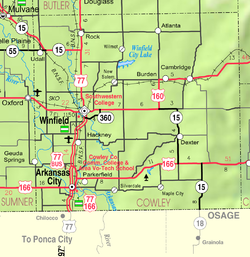 Wikimedia Commons has media related to Udall, Kansas. This page was last edited on 8 April 2019, at 20:03 (UTC).